On the 11th (Mon), take in the spiritual surroundings of Battistero di Parma, step into the grandiose world of Castello di Torrechiara, then admire the natural beauty at Labirinto Della Masone, then step into the grandiose world of Rocca Sanvitale di Fontanellato, and finally take in the spiritual surroundings of Cattedrale di Parma. To find maps, ratings, reviews, and tourist information, go to the Parma online travel planner . Use the Route module to find travel options from your starting location to Parma. In February, daily temperatures in Parma can reach 9°C, while at night they dip to 1°C. Finish your sightseeing early on the 11th (Mon) so you can take a train to Modena. 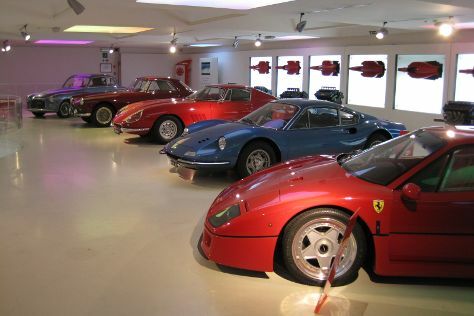 On the 12th (Tue), examine the collection at Acetaia Giuseppe Giusti, examine the collection at Panini Motor Museum, then see the interesting displays at Museo Ferrari, then get the adrenaline pumping with an extreme tour, and finally examine the collection at Casa Museo Luciano Pavarotti. Get ready for a full day of sightseeing on the 13th (Wed): learn about winemaking at Acetaia Villa San Donnino, then examine the collection at Lamborghini Museum, then appreciate the extensive heritage of Piazza Grande, and finally learn about all things military at Sala Museale dell'Accademia Militare. For where to stay, traveler tips, more things to do, and more tourist information, use the Modena day trip planner . Take a train from Parma to Modena in an hour. Alternatively, you can drive; or take a shuttle. In February, daily temperatures in Modena can reach 10°C, while at night they dip to 1°C. Wrap up your sightseeing by early afternoon on the 14th (Thu) to allow time for the train ride back home.